SuperNET, a mega network of cryptocurrencies that offers innovation in the digital currency sector, has announced its Platinum Sponsorship of the unprecedented Drachmae project. Drachmae undergoing research in Greece to see if the technology has a viable opportunity as a parallel digital currency to the Euro. Groundbreaking Crypto777 technology will enable private chains for Drachmae users. SuperNET was founded almost 9 months ago, and in that time has built up the largest collaborative network of digital currency developers and enthusiasts in the world: with over 700 members. 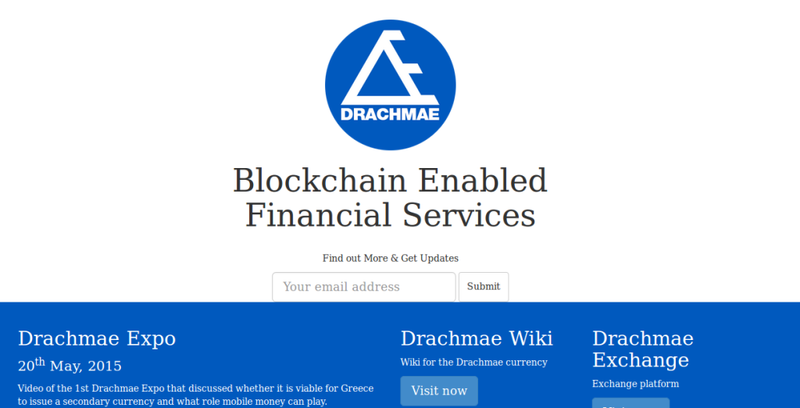 Drachmae, its newest entrant offers an unprecedented project to outline a “Blockchain Solution For Greece”. Drachmae’s founder, Lee Grant of Coinstructors, is currently in Greece on an exploratory trip for a small test case to present Drachmae as an innovative solution to obtain live test results to confirm in the different case scenarios if the Blockchain can be used and how. Lee has also been invited to Singapore, to present and discuss Drachmae to the Asian banking sector in a round table meeting in July. Drachmae is a centralised hybrid banking platform that harnesses the security and transparency of blockchain technology. As a complex blockchain project, Drachmae requires infrastructure that supports multiple blockchains. As well as supplying a pool of digital currency developers and professionals, SuperNET also provides the multi-blockchain technology that will contribute to Drachmae’s success. SuperNET’s 700 + members also bring to the Drachmae think tank immense technical expertise. SuperNET’s Sponsorship enables Drachmae to be presented on the 4th of July in London at a private and closed door event to the Fintech world. Drachmae will also be presented on the 9th of June at the Crypto Workshop at www.payexpo.com, alongside blockchain development platform NXT, which is the Crypto Sponsor at Payexpo.Another recent SuperNET project is the Crypto777 NXT Asset which is listed on www.secureae.com. SuperNET’s sponsorship of Drachmae project enables Coinstructors presence with the NXT Team at this year’s Payexpo, and adds to the credibility of Drachmae as a viable option to solve real time issues with blockchain technology. We’re very excited by Drachmae’s potential to demonstrate the way governments and their citizens can take advantage of the unprecedented opportunities provided by blockchain technologies. About Bitcoin PR Buzz:Bitcoin PR Buzz has been proudly serving the PR and marketing needs of Bitcoin and digital currency tech start-ups for over 2 years. Get your own professional Bitcoin and digital currency Press Release. Click here for more information.